This course is suitable for anyone who wants to gain an in-depth understanding of Six Sigma, including those who are new to the concept of Six Sigma but are ambitious about learning and applying the Six Sigma principles within their organization. There are no pre-requisites for learners wishing to complete the Six Sigma Advanced course and successful students will be awarded a Six Sigma Certificate of completion. Why Study Six Sigma Green Belt Advanced with 4PA? Our Six Sigma Green Belt Advanced eLearning course is assessed based on the learning outcomes from the core modules in the course. There are no pre-requisites for learners wishing to complete this Six Sigma Green Belt Advanced course and if successful, you will be awarded a Certificate of completion from 4PA. 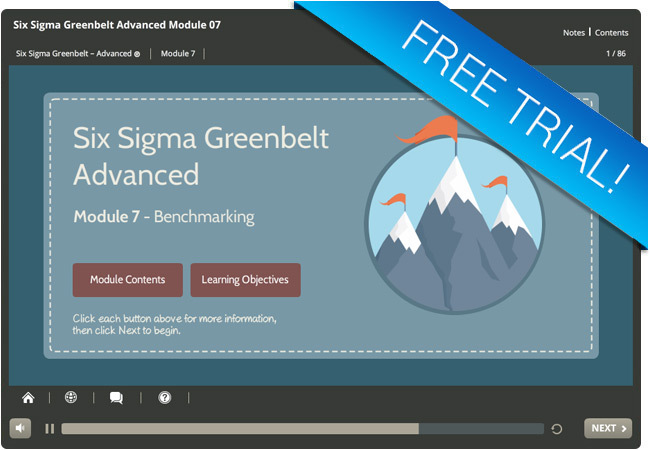 Why not try out a free trial module from our Six Sigma Green Belt Advanced eLearning course! In this Six Sigma Advanced trial module, you will learn how to achieve your Six Sigma Organization’s ultimate goal of using quantitative methods to improve processes to Six Sigma standards, via a mixture of interactive and audio techniques to enhance the learning experience. Like the full Six Sigma Green Belt Advanced eLearning course, you can access this free trial module from any device whether you are at home, at work, or on the move!